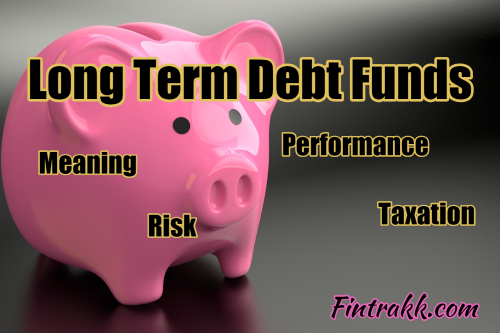 If you wish to know, What are Long term debt funds, their meaning and past performance, this post is something of your interest. You shall also become aware of the risk involved while investing in these mutual funds. You shall also learn about the taxation rules as applicable to these long term debt funds in India. Long term debt funds are one of the segments of mutual funds which invest in long-term debt securities and money market instruments. The objective of the fund is to derive interest income mainly from corporate bonds and capital appreciation which is dependent on macroeconomic factors like interest rate, liquidity, inflation. These are actively managed funds and are a good alternative for risk-averse investors to achieve financial goals in the long time period. Long term debt funds are expected to deliver higher return percentage than fixed deposit. These funds are much helpful to those investors who are nearing their retirement and want to have less risk investment option than equity funds. As the fund invests in various papers of debt securities with different credit rating, the Fund manager can have a diversified portfolio of securities according to the macroeconomic factors. How do Long Term Debt Funds work? These funds invest in a mix of government bonds, corporate bonds, government securities, securitized debt. The investments are made in high credit rated securities as this helps to provide liquidity and avoid volatility in the portfolio. The objective of the fund is to generate regular interest income to investors. As the price of the fund is impacted by interest rate risk, inflation, liquidity in the system which may result in capital appreciation of the fund. In a falling interest rate scenario yield of the bond will decrease, thus increasing the price of the bond and conversely when interest rate rises yield of the fund increases and price decreases. The fund manager proportionately adjusts the holding of the portfolio to avoid the risk of downside. Gilt funds invest in only government securities of longer maturities. The credit rating of the securities is highest as they are issued by the government. As it has only G-sec in its portfolio, the impact of interest change in yield of the fund is more. With favourable economic direction, there is an opportunity for investors to get higher returns. GILT funds are more volatile than Income Funds as the type of the securities involved and Income Funds diversify their portfolio in order to get maximum gains. During rising interest rate period, GILT fund becomes unattractive as yield rises and prices fall. By keeping a longer time view and investing systematically, returns can be maximised. The composition of the portfolio (corporate debt, G-sec, marketable securities) of the fund mainly determines the expected return, risk, and liquidity of the fund. The return of the Long-term debt fund depends on the average maturity of the portfolio. With high maturity period, any decrease in interest rate will decrease the yield of the bond and increase the price of the bond but it also increases the volatility. A fund can also increase its return by lowering the credit rating of the portfolio, but it will increase the risk of volatility in the fund. ALSO READ What to expect from Indian Stock Market in 2018? The historical annualised returns show that the top performing long-term funds are more than fixed deposit returns and are able to generate 9-12% of annualised return. It is expected to give more returns than Fixed Deposit. Less Tax Liability than Fixed Deposit. Professional Management of portfolio and diversification. Risk of interest rate, Liquidity change. Bond funds are taxed differently from equity funds. A debt fund, if sold within 3 yrs of the investment is classified as short-term investment and is taxed at 10% (Short term capital gain tax). If debt funds are held for more than 3 yrs (long term capital gain tax), it is taxed 20% with the benefit of indexation. The dividend income is tax-free in the hands of the investor as the Dividend Distribution tax of 15% is deducted from source. Post demonetization, the shine in the bond market has returned. Easing liquidity conditions and fall in bank rates has increased the return of medium term and long term GILT funds by 5-7% in less than a month after the note ban. Low inflation and RBI’s move to cut Repo rate has also inserted growth in the bond market. The yield of 10 years G-sec has decreased by 70 basis points within the month demonetization. Going forward, the expectation of reduction in repo rate of by RBI, we may see volatile in the bond market in near term. Long Term Debt Funds provide an attractive rate of return when we compare it with fixed deposit return. Though the risk associated with investment in debt funds are more, but with the superior risk-adjusted return helps the investor in long run. In a falling interest rate scenario, Debt fund outperforms the fixed deposit by a good margin. Efficient risk management by both fund manager and the investor can help to get the desired result. What is your take on this long term investment option? Do you like investing in debt mutual funds or you wish to stick to the traditional safer options like Fixed deposits and Post Office Saving Schemes? Do share your feedback on the same. Disclaimer: This post is not a financial advice. Mutual funds are subject to market risk. Please follow due diligence and be cautious while investing your money in any of the risky asset classes or consult your financial adviser before taking an investment decision. Fintrakk.com or any of its representatives are not responsible for any loss that might happen due to your investments.